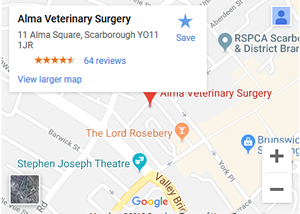 We have a large free car park available at the rear of the surgery and parking at the front of the practice in Alma Square, which is metered in the daytime. "Always seem to be genuinely concerned about the animals, and always give a 1st class service. The prices are reasonable and the staff are very friendly - oh and there is parking around the back - great in the centre of Scarborough." 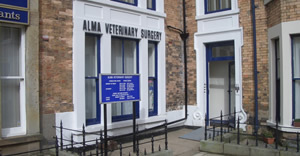 "May I thank your staff at Alma Vets for their support - the reception staff dealt with my telephone calls and surgery visits in a calm and reassuring manner, and the vets were so caring"